Forecast models have been advertising a very strong upper low for a few days now east of Bermuda. The low has very cold air aloft which is favorable for shower and storm development. If the showers and storms persist, they can warm the central core of the low to transfigure it into a subtropical or tropical system. Usually a storm like this meets the wind criteria and only the warm core structure keeps it from being classified. The system is really a massive occlusion at this time. It does appear to be taking on some tropical characteristics and has a chance to be classified. 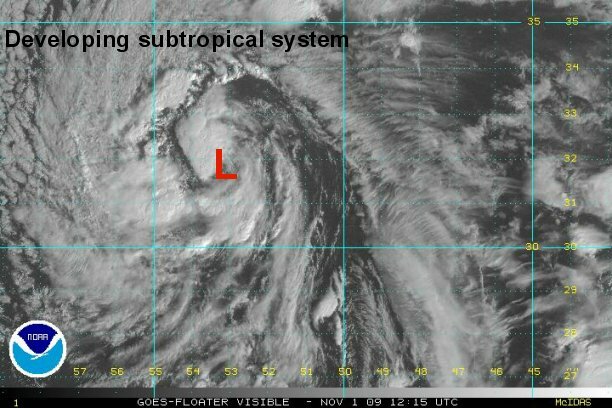 As of 8 am est / 9 am ast the low is centered near 31.8 N / 53.0 W or about 645 miles east of Bermuda. It is moving west northwest at 24 mph. Top sustained winds are near 40 mph. Forecast models take it northwest - east of Bermuda then into the northern North Atlantic merging with a mid latitude storm in a few days near or east of Newfoundland. 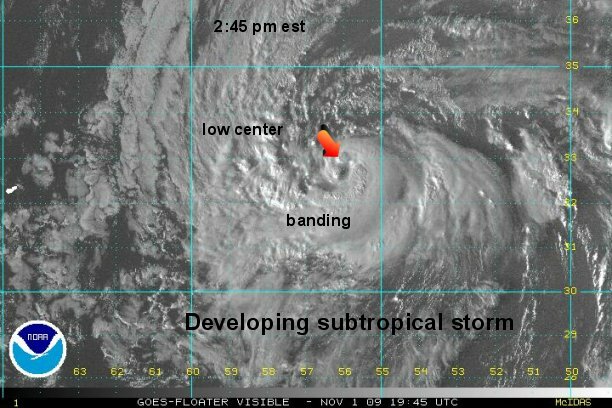 Banding is rapidly taking shape as well as a core of convection in the center of the low. 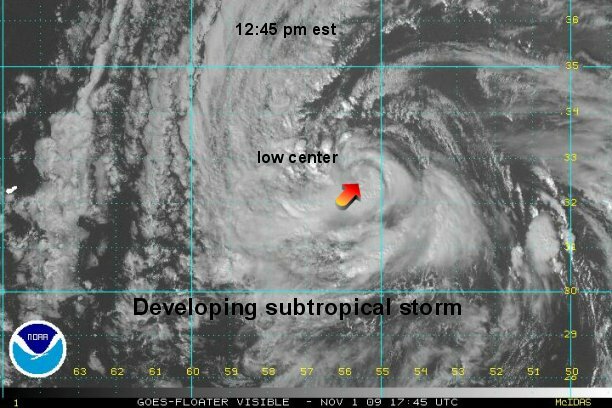 It is making the transition to at least a subtropical storm now. It will be interesting to see how soon NHC will name it. 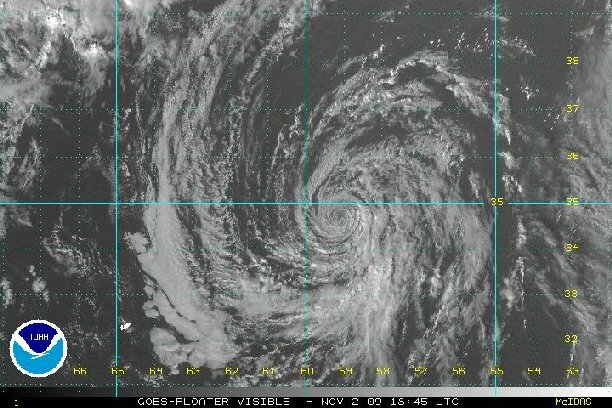 As of 4 pm est / 5 pm ast the low is centered near 33.0 N / 56.3 W or about 485 miles east of Bermuda. It is moving west northwest at 19 mph. Top sustained winds are near 45 mph. Satellite imagery shows a distinct decrease in the convection near the circulation. NHC upgraded their outlook to "high" for development, but if the convection doesn't regenerate this system should not be classified now. They noted that the low is still tied to a frontal boundary. We noted the same yesterday, but systems similar to this one have been classified in the past. The low has slowed down since yesterday and has turned west ahead of an approaching front. Forecast models did not paint this scenario well. The low may loop, or move very slowly before resuming the northerly motion. 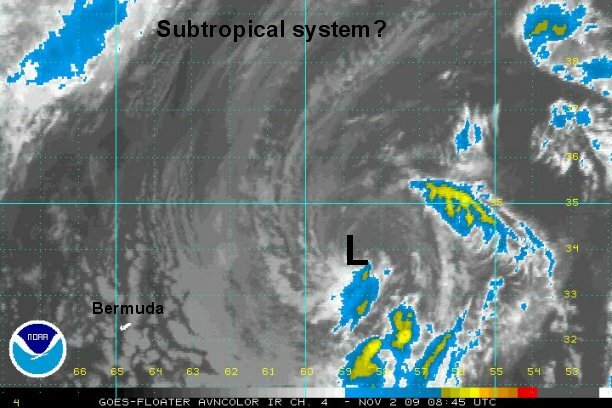 As of 7 am est / 8 am ast the low is centered near 33.9 N / 58.8 W or about 360 miles east northeast of Bermuda. It is moving just south of west at 10 mph. Top sustained winds are near 45 mph. Forecast models take it north, then northwest into the northern North Atlantic merging with a mid-latitude storm in a few days east of Newfoundland. It looks like Ida's chance to make it to a named subtropical storm has passed. It seemed as though this system had qualified itself with the characteristics of a subtropical storm for about 12 hours. It looked like it has gained enough core convection and had separated itself from frontal characteristics for a while yesterday. Deep convection fired on the southeast side of the low overnight. It is now starting to weaken again. The gale center has also ridded itself of the upper low, becoming a more tropical system. It is being sheared from westerly winds aloft. Certainly, there have been systems in much worse shape that have been classified. 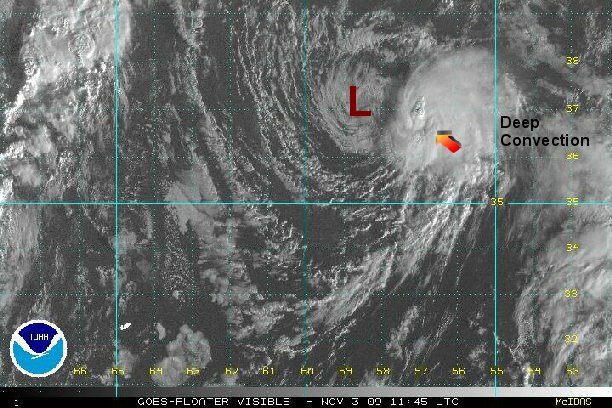 NHC dropped their mention on it as it moves into the open waters of the north Atlantic.